The cabinet build, the sump, piping, wiring, all of it. Just a super clean setup all around. You really do nice work. So you switched to radians? How they working out for you? I have lost all concept of reality and live in an SPS world now. I'd rather Die on my feet, than Live on my Knees. Current Tank Info: 150g SPS Reef, 2x250w 14k Pheonix Metal Halides w/T-5 Actinics, 2 Tunze 6095's, Tunze 7096 controller, Ozone, Precision Marine Skimmer, Reef Octopus Bio-Churn Bio Pellet Reactor, GFO & Carbon Reactor, Ozone Reactor, ATO, Reef Keeper. quick question. I'm building a tank of my own and what I love most about yours is the rock work. How did you get your rock to balance on the bottom and what did you use to stick your rock together with. 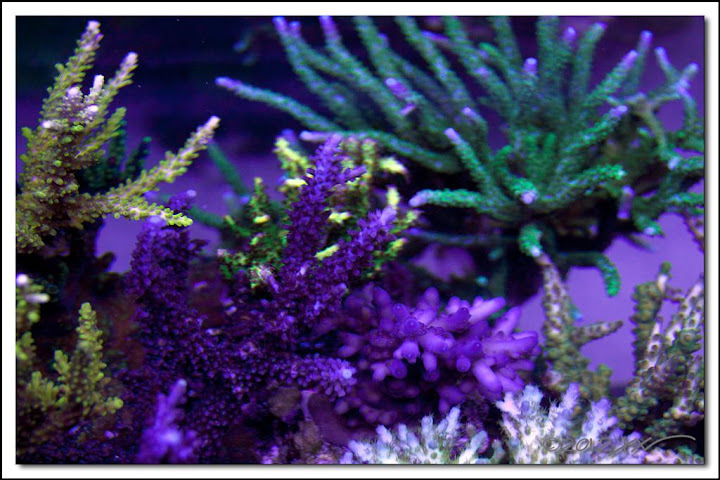 I have to say though that yours is a front runner for my favorite, reasonable obtainable, reef tank that I feel I could aspire to. Thanks for the inspiration. Personally, I liked the look of the tank better before you put in the T5s. I seemed more surreal to me. Still though, beautiful job. Hey man, this thread has been too quiet. Howz the tank doing? Love to feast my eyes on an update...please! just an amazing looking tank! I am planning an upgrade and want to go the Peninsula route for my aquascaping. Can you tell me how you did the rock work? Wow I can’t believe that I haven’t updated this tread in over 6 months. Sorry about the late reply. Thanks for the kind words peeps!!! I tried my best to keep the system as clean and neat as much as posible as this is one of the first thing that everyone see when they walk in our home!!! I didn’t swich to radians…. Were you referring to something else? Thanks for the kind words noved & kissman!!!! The rock work were put together outside the aquarium and then pegged with an acrylic rod then moved back inside the aquarium no type of glue was used in the process. I just made sure the rocks are locked in to each other then drilled a hole that was just enough for the acrylic rods to go through. 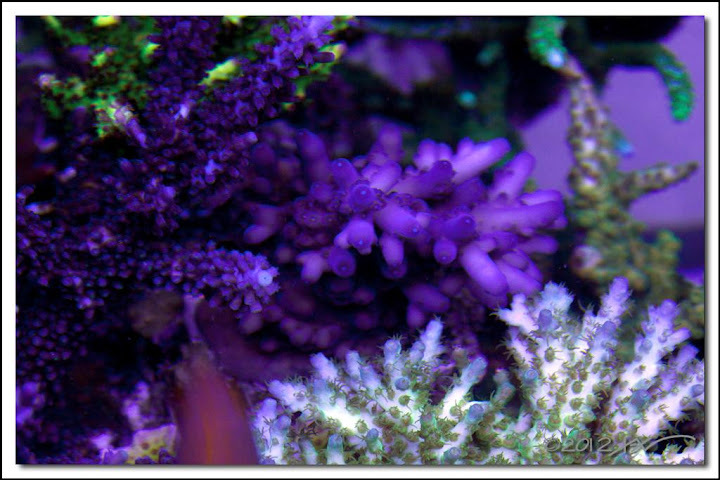 noved, as per your comment about the MH vs T5 for the most part I do have to agree with you, it might just be some of my recent issues with the system or my corals are just larger now, but it seems that I used to get better growth and color with the MH. Good luck to both of you on your current/future build! I know it’s been awhile…. been super busy with the new kid, and at work and I was just trying to make sure the system is somewhat alive. The next post would have a few random shots while I was doing water change. Beautiful. Just beautiful. Keep up the good work man. You've got a beautiful system here. Forgot to ask you: what T5 combo are you currently using? Your comment re: MH vs T5 suggests that perhaps in hindsight you were better off with MH's? Is the issue paleness? Are you still running any form of carbon dosing like pellets? Thanks in advance for taking the time to answer my questions. Thanks for the kind words peeps! sahin, actually, it's better color and better/faster growth at least from my point of view, and this is only true with a few acros. Maybe your right I might have been off with MH, but I think this hobby evolves and am just going with the flow..... As per carbon dosing, am back to dosing vodka. 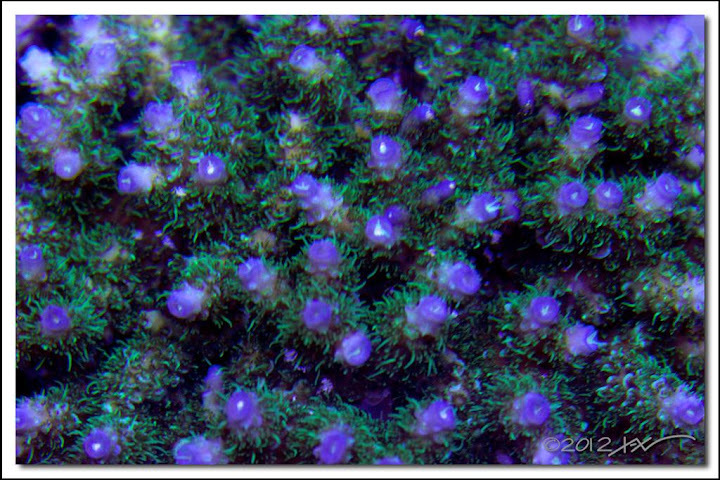 Mixed reef emphasis on SPS. Tangs, Triggers, Bartlets, CBB, Goldflake Angel, and a Pigmy or two. Current Tank Info: 250G SPS Mixed Reef. ATLAS 84x28x24. SuperMarin 250. Cebu Sun 3 x 250WMH Radiums 4 x 80W T5. Profilux 3 w/GHL dosing CA-ALK-MG. Moved by Tunze and Vertex. Reef Octopus 5K return. Thanks for the kind words Mike! 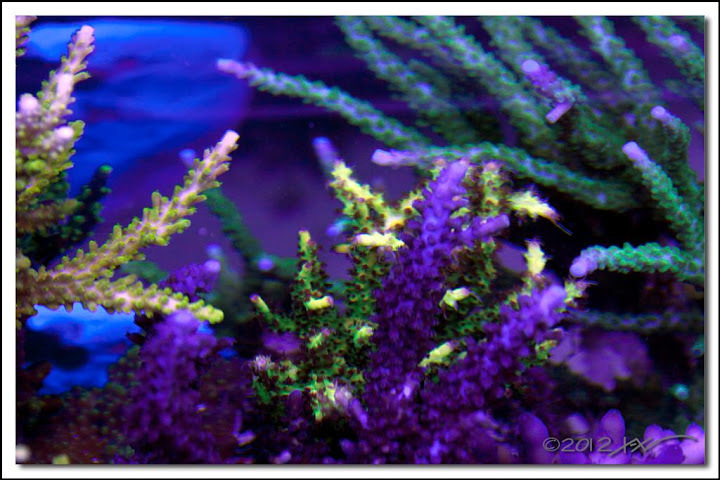 although I love the look of the tank with the pure actinic during dawn/dusk I feed that changing this to Blue Plus will give me a little better growth and maybe even improve the colours a little bit. looks great as always Ian (I believe?). Stunning! Congrats on your efforts! Cheers! Custom 48 x 30 x 20 Starphire tank peninsula. Thanks for the kind words rowdy29can! Thanks for the compliments Darryl!! Mike, are you saying this because I might have to much blue bulb or just brighter system? sweet tank for sure, well done! Colors are awesome and the scape is amazing. God is playing a comic to an audience that's afraid to laugh. 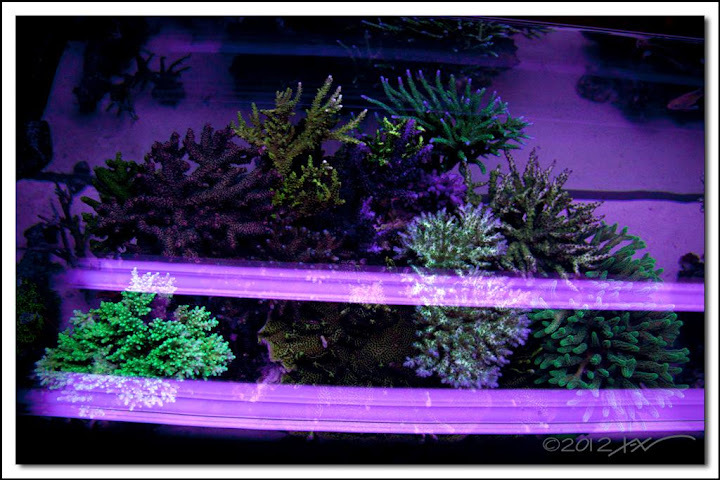 Current Tank Info: 90 G reef tank, 15 G sump, Red Sea Skimmer, T5 Lighting 150lbs live rock. 1 Yellow tang, 3 blue Chromis, 1 Royal Gramma, Flame Angel, 2 cleaner shrimp, 2 emerald crabs, 3 peppermint shrimp and a bunch of turbo and narsicius snails. I always love revisiting this thread; your tank is absolutely wonderful. Keep up the great work. It's an inspiration.